Bear & Son Cutlery, Inc., has purchased the sharpener division of GATCO. Bear & Son Cutlery, Inc. announced Nov. 14 that it has acquired the sharpener division of GATCO. Ken Griffey, president of the Jacksonville, Alabama, manufacturing company, said he’s been in the knife industry for 39 years, and for 28 or 29 of those years Bear & Son has worked trade shows and other events side by side with the Great American Tool Company, Inc., or GATCO, as it was better known. Griffey expressed confidence that Bear & Son can now truly be a one-stop shop for knife enthusiasts. “It’s a natural fit,” he said. Sharpener production at GATCO ceased in June or July, Griffey explained, so the number one order of business is to get merchants restocked. For the immediate future, GATCO sharpeners will continue to be made in both the USA and China. In short order, Bear & Son executives will assess whether some manufacturing can be moved back to the United States. All GATCO sharpeners will continue to be made with the possible exception of one or two models. In place of those, Bear & Son will debut two new sharpeners to complement its knife lines. Griffey said he saw 3D models of these new sharpeners but wants to see the real thing before he approves production and sets price. Decisions will be made in time for any new products to make their first appearance at the SHOT Show, Jan. 17-20, in Las Vegas, Nevada. GATCO celebrated its 25th anniversary in 2014. Founded by John Anthon and originally based in Getzville, New York, its specialty was offering a wide range of sharpeners. Angle guide, pull-through, stone, diamond abrasive, ceramic, carbide—GATCO had a model. The company’s Tri-Seps sharpener was the BLADE Magazine 1999 Accessory Of The Year. Griffey said the purchase of GATCO makes Bear & Son Cutlery a full one-stop shop for knife enthusiasts. Always strong on the outdoor and hunting side of the knife market, the company also offers its Bear Ops line that focuses on law enforcement, military and self-defense knives. A new line, the affordable Bear Edge, will offer knives with some components made in China but assembled in the USA. 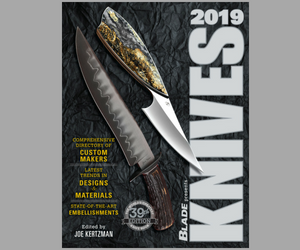 Steve Shackleford, BLADE® editor, contributed to this article. This Gear Care Kit Field Grade Tin is a perfect stocking stuffer and includes a GATCO Super Micro sharpener.